Analysis: While Green said he's ready to play, Hobson notes that the receiver likely will be eased back into action just four months removed from a surgical procedure that came with a recovery timeline of 3-to-4 months. Regardless, Green's active participation in voluntary workouts to any extent bodes well for his ability to garner extensive reps during an offseason in which the entire Bengals offense will be learning a new system under incoming coach Zac Taylor. Analysis: Though the club didn't officially announce Green would opt for surgery on the nagging right foot injury, that was always the expected outcome after the Bengals placed him on injured reserve last week. He's estimated to need 3-to-4 months to recover from the procedure, putting him at risk of missing OTAs. Green should be back to full strength for training camp and well before the start of the season to reclaim his post as the Bengals' undisputed top pass-catcher. Green will undergo season-ending foot surgery this week that will require 3-to-4 months of recovery, Adam Schefter of ESPN reports. Analysis: In his attempt to end a three-game absence Sunday, Green lasted just 17 snaps on offense before aggravating his right foot. With his fate sealed for the current campaign, he'll finish with 46 receptions (on 77 targets) for 694 yards and six touchdowns in nine appearances. The aforementioned rehab timetable will allow him to be 100 percent by the time OTAs kick off in May. Green (foot) may be placed on injured reserve after he undergoes testing Monday. Analysis: Green returned from a three-game absence for Sunday's matchup with the Broncos, only to aggravate his foot after playing just 17 offensive snaps. With a playoff appearance looking all but impossible, there isn't much reason for Green to continue battling through the injury. He might be held out for the rest of the season even if he doesn't need surgery. Green was carted off the field Sunday against the Broncos after injuring his right foot, Katherine Terrell of ESPN.com reports. Analysis: It looked like Green had trouble putting weight on his foot prior to being carted off, and he was quickly ruled out for the rest of the game, so at first glance this has the looks of an issue that could force the wideout to miss time beyond Sunday. Green (toe) doesn't carry an injury designation into Sunday's game against the Broncos after logging a full practice Friday, Katherine Terrell of ESPN.com reports. Green (toe) was a limited participant in Thursday's practice, Katherine Terrell of ESPN.com reports. Green (toe) was a limited practice participant Wednesday, Jay Morrison of The Athletic reports. Green (toe) was present for practice Wednesday, Paul Dehner Jr. of The Cincinnati Enquirer reports. Analysis: Another update on the extent of Green's involvement in the session will come later Wednesday, but the wideout relayed earlier in the day that he's confident he'll play Sunday against the Broncos, according to Katherine Terrell of ESPN.com. 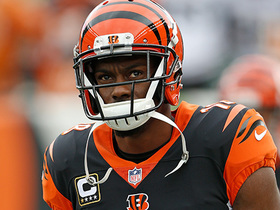 Green has missed the Bengals' last three games with the right toe injury, all of which have been Cincinnati losses. Green (toe) said prior to Wednesday's practice that he expects to play in Sunday's game against the Broncos, Fletcher Page of The Cincinnati Enquirer reports. Green (toe) is listed as inactive Week 12 against Cleveland, Paul Dehner Jr. of The Cincinnati Enquirer reports. Analysis: Earlier reports Sunday morning indicated that Green would not dress for the contest, and that news was confirmed with the release of the inactives list. Considering Green did not take the practice field in any capacity this week, his status for Week 13 remains a bit murky. In the meantime, Cincinnati will move forward with a wide receiver group led by Tyler Boyd and John Ross. Green (toe), who is listed as doubtful for Sunday's game against the Browns, won't be available to play, a source told Adam Schefter of ESPN. Analysis: The Bengals downgraded Green from questionable Saturday after he missed the entire week of practice. Green may go through some pregame work as he looks to put the right toe injury behind him, but even if he checks out positively, the Bengals seem inclined to err on the side of caution and hold him out. Tyler Boyd and John Ross would continue to benefit from added involvement in the passing game if Green misses a third straight game as anticipated. The Bengals downgraded Green (toe) to doubtful for Sunday's matchup with the Browns following Saturday morning's workout, Jay Morrison of The Athletic reports. Analysis: Green, who has missed the Bengals' previous two games, is trending toward another absence in Week 12. Assuming he is unable to see a quick recovery ahead of Sunday's kickoff, Tyler Boyd and John Ross figure to continue heading the team's receiving corps. Though Green (toe) didn't practice this week, he's listed as questionable for Sunday's game against the Browns, Geoff Hobson of the Bengals' official site reports. Analysis: The team plans to re-evaluate Green on Saturday, at which point there would ideally be added clarity with regard to his Week 12 status. If his situation turns into a game-time decision, fortunately the Bengals kick off at 1:00 ET on Sunday. If Green ends up missing this weekend's contest, Tyler Boyd and John Ross would continue to head the team's wideout corps. Coach Marvin Lewis isn't ruling Green (toe) out for Sunday's game against the Browns, indicating that the wideout will be re-evaluated Saturday, Jay Morrison of The Athletic reports. Analysis: Green didn't practice this week, so he could be headed for an official doubtful designation for Sunday's contest, but Friday's final injury report will confirm his listed status on that front, one way or the other. Green (toe) didn't participate at the part of Friday's practice open to the media, Fletcher Page of The Cincinnati Enquirer reports. Analysis: Green didn't practice the last two days and that trend appears to be continuing Friday. The 30-year-old also declined to talk to reporters prior to Friday's practice, and he previously indicated he would talk once ready to return, Katherine Terrell of ESPN.com reports. The week began with optimism for Green's chances of playing Sunday against the Browns, but he currently seems more likely to miss his third straight game. Green (toe) was listed as a non-participant in Thursday's practice, Geoff Hobson of the Bengals' official site reports. Analysis: Per Hobson, back-to-back absences on Green's part suggest that the wideout is probably more doubtful than questionable for Sunday's game against the Browns. Of course, Green's outlook on that front could brighten (at least some) if he practices in any capacity Friday. Though Green (toe) won't practice Wednesday, he's expected to do so as the week progresses, Katherine Terrell of ESPN.com reports. Coach Lewis expressed optimism about Green's chances of playing Sunday against the Browns, according to Paul Dehner Jr. of The Cincinnati Enquirer, "He's ready to get back to work," Lewis said. "If he feels good enough to go and we judge him good enough by our eyes, he'll be good to go." Green (toe) has a "good chance" of playing Sunday against the Browns after he received positive news during his follow-up visit with foot specialist Dr. Robert Anderson earlier this week, a source told Josina Anderson of ESPN. Green (toe) is inactive Sunday against Baltimore. Analysis: The Bengals failed to officially rule out their top wideout for the Week 11 matchup, but the expectation all along was that Green would sit anyway. The official inactive list will confirm that notion, leaving Tyler Boyd and John Ross as the two probable starters at wide receiver. At the very least, Green appears to be headed in the right direction heading into the Week 12 matchup against Cleveland. Green (toe) made the trip with the Bengals to Baltimore and plans to hold a workout early Sunday before his status for the game is decided, Ian Rapoport of NFL Network reports. The wideout is officially listed as doubtful on the Bengals' injury report and the expectation remains that he'll sit out a second straight game, according to Adam Schefter of ESPN. Green (toe), who is listed as doubtful for Sunday's game against the Ravens, isn't expected to play, Adam Schefter of ESPN reports. Analysis: Green is trending toward his second straight absence, but his status won't be officially confirmed until the Bengals release their inactive list 90 minutes prior to Sunday's 1 p.m. EST kickoff. Assuming Green is included among the inactives, Tyler Boyd and John Ross (groin) are expected to see increased targets against Baltimore's third-ranked pass defense (205.2 yards per game allowed). Updating an earlier report, the Bengals are now listing Green (toe) as doubtful rather than out for Sunday's game against the Ravens, Geoff Hobson of the team's official site reports. Green (toe) has been ruled out for Sunday's game against the Ravens, Paul Dehner Jr. of The Cincinnati Enquirer reports. Analysis: Per Jay Morrison of The Athletic, Green was spotted working on the side during Friday's practice, which suggests that the wideout is inching closer to a return in advance of the Bengals' Week 12 game against the Browns. With Green and Josh Malone (hamstring) both out this weekend, Tyler Boyd is slated to head the team's wideout corps. John Ross is a candidate to see a key role alongside Boyd, assuming a groin issue that has him listed as questionable doesn't prevent him from playing. Green (toe) worked on the side during Friday's practice, Jay Morrison of The Athletic reports. Analysis: It's possible Green could get some work in behind the scenes Friday, but it's looking like he will sit out practice for the third day in a row. He was a long shot to play this week to begin with, and he likely would need to get in some type of practice in order to take the field. The Bengals will reveal after practice whether or not Green has any chance to play in Week 11 against the Ravens, but the odds aren't looking good. Green (toe) wasn't spotted at the portion of Thursday's practice that was open to the media, Jay Morrison of The Athletic reports. Though Green (toe) didn't practice Wednesday, coach Marvin Lewis was unwilling to rule the receiver out for Sunday's game against the Ravens, Jamison Hensley of ESPN.com reports. "Hopefully we get him out there on Sunday," Lewis said. Analysis: While Lewis' words Wednesday offer hope that Green could play as soon as this weekend, Katherine Terrell of ESPN.com previously suggested that the wideout was unlikely to return until at least December. Whether Green actually has progressed to the point that he might play in Week 11 remains to be seen, but for now he can be considered questionable until further details arrive regarding his status. Green (toe) said Wednesday he's feeling better, but he didn't take the field Wednesday for practice or any rehab work, Geoff Hobson of the Bengals' official site reports. Analysis: Green appears in line to miss a second straight game Sunday at Baltimore and may remain out of the lineup until December. It's good to hear he's making some kind of progress, but the rehab plan still seems to call for rest above all else. Alex Erickson, Cody Core and Auden Tate are all candidates to get snaps behind Tyler Boyd and John Ross. The Bengals could be without Green (toe) until December, sources tell Adam Schefter of ESPN. Green (toe), who has been ruled out for Sunday's game against the Saints, is unlikely to play Week 11 in Baltimore either, Ian Rapoport of NFL Network reports. Analysis: The news item aligns with what Adam Schefter of ESPN reported earlier in the week. 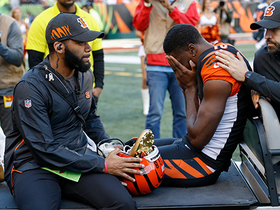 While Green didn't require surgery to address the right toe injury he suffered in the Week 9 win over the Buccaneers, the Bengals may not have a clear idea on how many games the wideout might miss until he's re-evaluated within the next few days. Green's absence for at least Week 10 and likely Week 11 opens the door for Tyler Boyd to serve as the Bengals' No. 1 wideout. Green (toe) is expected to miss at least two games, at which point his right foot will be examined to determine if he can play, Adam Schefter of ESPN reports. Coach Marvin Lewis said Green (toe) does not need surgery, Paul Dehner Jr. of The Cincinnati Enquirer reports. Green (toe) doesn't appear to be present at the Bengals' team facility Monday, Katherine Terrell of ESPN.com reports. Green won't have a firm diagnosis on his right toe injury until he meets with Dr. Robert Anderson in Green Bay this week, but the Bengals are prepared for him to miss "some games," Adam Schefter of ESPN reports. Green (toe) is scheduled to meet with foot specialist Dr. Robert Anderson in Green Bay in the coming days, Ian Rapoport of NFL Network reports. 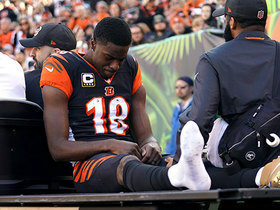 Green was still dealing with swelling on his right toe Wednesday, indicating a need for the Bengals to send him in for additional tests, Paul Dehner Jr. of The Cincinnati Enquirer reports. Analysis: Green's 2014 season was significantly hampered by an injury to his right big toe, as he missed three games and parts of many others due to that issue. It's fortunate for the Bengals that Green will have some added time to recover with the team on bye in Week 9, but the injury has the potential to bother him in the second half of the campaign. Green injured a toe on his right foot during Sunday's 37-34 win against the Buccaneers, Geoff Hobson of the Bengals' official site reports. Green was seen with a boot on his right foot at the Bengals' facility Tuesday, Jay Morrison of The Athletic reports. Analysis: This is the first mention of Green tending to a foot injury, and the Bengals may not touch on the issue for some time with the team in the middle of its bye week. He logged a normal snap count (62 of 66 on offense) en route to five catches (on seven targets) for 76 yards and one touchdown this past Sunday against the Buccaneers, so Tuesday's development could be a precautionary measure. Green brought in five of seven targets for 76 yards and a touchdown in the Bengals' 37-34 win over the Buccaneers on Sunday. Green hauled in seven of 14 targets for 117 yards in Sunday's 45-10 loss to the Chiefs. Green caught seven of 12 targets for 85 yards in Sunday's 28-21 loss to the Steelers. Analysis: Green led his team in receiving yards but was outplayed by teammate Tyler Boyd (seven catches for 64 yards and two touchdowns). The two productive wideouts have coexisted well thus far, and that should be the case again in Week 7 against a porous Chiefs secondary. Green caught six of 10 targets for 112 yards in Sunday's 27-17 win over the Dolphins. Analysis: Green reestablished himself as the Bengals' go-to aerial option, topping 100 receiving yards for the first time this season while no teammate even reached 50. With 409 yards and five touchdowns through five weeks, Green has once again been one of the league's most productive wide receivers heading into a Week 6 home tilt against the Steelers. Green caught four of eight targets for 78 yards and a touchdown in Sunday's 37-36 thriller over the Falcons. Green (pelvis) logged another full practice Friday and doesn't have a designation on the final injury report for Sunday's game in Atlanta, WKRC Cincinnati's Richard Skinner reports. Analysis: Green missed the second half of last week's 31-21 loss to the Panthers, but he made a quick recovery and returned to full practice participation Thursday and Friday. He should be fine to handle his typical high-usage role against an Atlanta defense that's solid at cornerback but shaky at safety. Green (pelvis) was a full participant in Thursday's practice, Katherine Terrell of ESPN.com reports. Green was a limited practice participant Wednesday due to what was classified as a pelvis injury, Katherine Terrell of ESPN.com reports. Analysis: Green came out of Week 3 action pretty banged up, with the soreness he endured in Sunday's loss to the Panthers having been previously attributed to groin and hip issues. Nonetheless, Green downplayed his aches and pains earlier Wednesday, a notion now supported by his participation -- albeit in a limited fashion -- in the Bengals' first practice of the week. Bengals head coach Marvin Lewis relayed Wednesday that Green (groin/hip) is feeling "fine," Katherine Terrell of ESPN.com reports. "He seemed to come around very quickly with the anti-inflammatories," Lewis said, regarding the wideout's recovery from injury. "We're very fortunate with that. Because I didn't know what he had injured. He was complaining about both sides." Analysis: Green's departure in Sunday's loss to the Panthers was previously attributed solely to a groin injury, but both of the wideouts hips were evidently aching as well. He also landed awkwardly on his shoulder during the contest, putting his health on shaky ground entering Week 4. While Green seems to be quite banged up, Lewis remains optimistic about the 30-year-old's outlook for this weekend's tilt against the Falcons, per Paul Dehner Jr. of The Cincinnati Enquirer. Coach Marvin Lewis didn't have any update on Green's groin injury Monday, Geoff Hobson of the Bengals' official site reports. Analysis: Despite sitting out the second half of Sunday's 31-21 loss to Carolina, the 30-year-old wideout said he should be fine for Week 4 against the Falcons. Of course, it would be unwise to place much confidence in the initial optimism, especially given that Green himself is the source. We may need to wait until Wednesday's injury report for the first real clue about his Sunday availability. Coach Marvin Lewis isn't sure if Green (groin) will be able to play in Week 4, but the wideout believes that he will be available next Sunday against the Falcons, per Geoff Hobson of the Bengals' official site. Analysis: Meanwhile, Jay Morrison of The Athletic relays that Green suggested the injury that forced him out of this Sunday's contest early was just a bruise. "I just came down on my hip and I guess my two bones just hit," Green said after Sunday's loss to the Panthers. "I didn't feel anything pop or anything like that. I don't feel like it's serious." Next up for the Bengals' wideout practice reps/targets if Green ends up missing any time are Tyler Boyd and John Ross. Green was forced out of Sunday's game against the Panthers with a groin injury. Analysis: Prior to his exit from the contest, Green hauled in five of his eight targets for 58 yards. Next up for the team's wideout targets are Tyler Boyd and John Ross. Green hauled in five of nine targets for 69 yards and three touchdowns in the Bengals' 34-23 win over the Ravens on Thursday. Green caught six of eight targets for 92 yards and a touchdown while losing one of two fumbles in Sunday's 34-23, Week 1 win over the Colts. Analysis: Green will need to clean up the fumbles, but he was otherwise his usual, stellar self. His 38-yard touchdown in the third quarter sparked a 24-0 Cincinnati run after Indianapolis raced out to a 23-10 lead. Green's made the Pro Bowl in each of his first seven seasons, and he's already laying the groundwork for an eighth such campaign. Green hauled in four of five targets for 50 yards and a touchdown in Sunday's 26-13 preseason win over Buffalo. Analysis: Green and quarterback Andy Dalton displayed their usual rapport, as the veteran receiver consistently got himself open and scored from 14 yards out. The seven-time Pro Bowler is unlikely to play in Week 4 of preseason, so the next time we see Green should be in the Sept. 9 season opener at Indianapolis. Green caught two passes for 48 yards in the first quarter of Thursday night's preseason game before sitting out the remainder. Afterward he expressed how pleased he was with the Bengals' offense under coordinator Bill Lazor, Katherine Terrell of ESPN.com reports. Green said he is comfortable with his current contract, a four-year, $60 million extension that runs through 2019, Paul Dehner and Jim Owczarski of The Cincinnati Enquirer reports. Green (knee) played in the Quavo celebrity flag football game April 1, Justin Felder of FOX5 Sports Atlanta reports. Green will skip the Pro Bowl, as he tends to a minor knee injury, the Cincinnati Enquirer reports. Green caught six of 10 targets for 81 yards during Sunday's 26-17 win over the Lions. Analysis: Despite a one-on-one matchup with Darius Slay, Green still led the team in targets, catches and yardage en route to his best output since Week 10. His long gain went for just 18 yards, but consistent contributions on routes of short and medium depth still helped him to a productive day. Green hasn't reached the end zone in three straight games, but he eclipsed 1,000 yards on the season in this one and will look to finish strong next week against the Ravens. Green caught two of four targets for 30 yards in Sunday's 34-7 loss to Minnesota. Analysis: Green was a non-factor as quarterback Andy Dalton came up short of 150 passing yards for the second consecutive week. This was only the star receiver's fourth game with fewer than 50 yards despite Dalton's struggles, so Green's likely to bounce back next week against the Lions. He'll need 20 receiving yards in that game to top 1,000 for the sixth time in seven NFL seasons. Green caught five of 12 targets for 64 yards and a lost fumble in Sunday's 33-7 loss to the Bears. Analysis: Green made his first two receptions on what would be the Bengals' lone scoring drive of the day, after failing to connect with Andy Dalton on any of their first three attempts. The 29-year-old caught two passes of 18 or more yards on the first drive of the fourth quarter, but fumbled the second away and wasn't able to reel more targets in after that. Things probably won't get any easier in Week 15 when he'll likely be shadowed by the Vikings' Xavier Rhodes. Green caught seven of 16 targets for 77 yards and two touchdowns in Monday night's 23-20 loss to the Steelers. 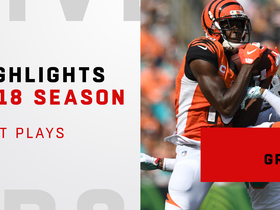 Analysis: Green led the Bengals across the board in receiving, with his target count setting a new season high. Monday also marked Green's first multi-touchdown game of the campaign, as he scored from eight and 15 yards out on respective first-half end-zone trips. Although Green had a 61-yard touchdown nullified by a debatable holding call during the third quarter, his output should definitely still please fantasy owners. Green (illness) logged a full practice Saturday and was not listed on the Bengals' final injury report heading into Monday's matchup against the Steelers. Analysis: Green was added to the injury report Friday after practicing in limited fashion due to an illness. However, he appears recovered from the issue, and looks on track to assume his usual role as the No. 1 receiver Monday barring any setbacks. Green was listed as a limited participant in Friday's practice due to an illness, Paul Dehner Jr. of The Cincinnati Enquirer reports. Analysis: Dehner relays that Green said he was just dealing with a minor cold and felt under the weather, so the expectation remains that he'll be able to play Monday against the Steelers. Even so, Green may need to put in a full practice Saturday during the Bengals' final session of the week in order to avoid a questionable designation heading into the Week 13 matchup. Green caught five of eight pass attempts for 66 yards in Sunday's 30-16 win over the Browns. Analysis: It is only the third time in his last nine games that Green has failed to find the end zone, and his 66 yards are his second-highest total over his last six contests. Still, his athleticism was on full display in this one, as he made an incredible grab and dragged both feet inbounds on a 13-yard catch toward the end of the third quarter. The 29-year-old will continue to be Andy Dalton's primary target when Cincinnati hosts Pittsburgh in Week 13. Green caught four of nine targets for 50 yards and a touchdown during Sunday's 20-17 win over the Broncos. Analysis: Green had a rather quiet game going into the fourth quarter, but an 18-yard touchdown reception salvaged his day from a fantasy perspective. While he's only surpassed 50 receiving yards in one of his last five games, three trips to the end zone during that span have benefited his fantasy owners. Green will look to further distance himself from recent quiet outings next week against the Browns. Green racked up 115 yards and a touchdown on five catches while being targeted seven times in Sunday's 24-20 loss to the Titans. Analysis: Green's 70-yard touchdown put his team up 20-17 with 5:03 to play, but the hosts responded with a beautiful scoring drive capped by a seven-yard DeMarco Murray receiving touchdown with 36 seconds to play. While the star wide receiver had actually been held below 50 yards in every game since Week 5, his big-play ability and high target volume make Green an every-week staple in fantasy lineups. According to a league official, Green won't receive a suspension for his altercation with the Jaguars' Jalen Ramsey during the Bengals' 23-7 loss Sunday, Adam Schefter of ESPN reports. Green was ejected from Sunday's matchup against the Jaguars in the second quarter, Katherine Terrell of ESPN.com reports. 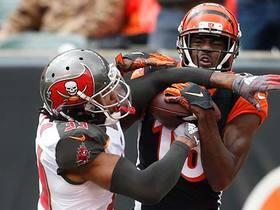 The Cincinnati Bengals have placed wide receiver A.J. Green on IR. Cincinnati Bengals wide receiver A.J. Green was carted off the field in the first half vs. the Denver Broncos. NFL Network Insider Ian Rapoport has the latest on the Cincinnati Bengals wide receivers heading into their Week 11 matchup vs. the Baltimore Ravens. 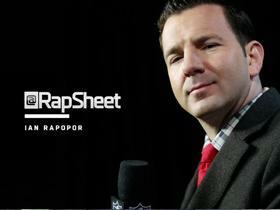 NFL Network's Ian Rapoport details the latest on Cincinnati Bengals wide receiver A.J. Green's foot injury. 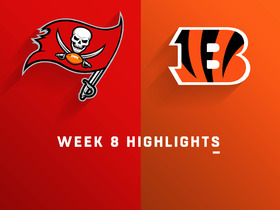 Watch complete highlights from the Week 8 match up between the Tampa Bay Buccaneers and the Cincinnati Bengals. 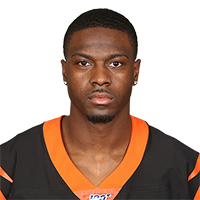 Cincinnati Bengals wide receiver A.J. Green gets up and hauls in a contested catch for a 17-yard touchdown. 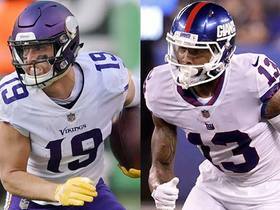 NFL Network's Marcus Grant ranks his top five wide receivers heading into Week 8. Take a look at the best catches from around the NFL in Week 7. 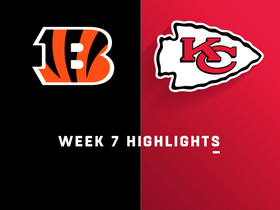 Watch as the Cincinnati Bengals take on the Kansas City Chiefs in Week 7.